I am thrilled to announce that I will be the alto soloist in Gustav Mahler’s iconic Symphony No. 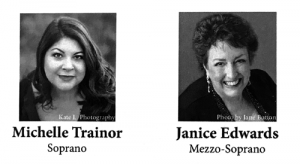 2 (“Resurrection”) on April 19 at 7:00 pm at the Capitol Center for the Arts in Concord, NH. This monumental symphony – requiring an orchestra of 100 and a full choir (preferably 100+) – is most likely on every dramatic mezzo’s (or contralto’s) “bucket list.” I say this because of the Fourth Movement, “Urlicht”, which is a gorgeous solo piece for mezzo and orchestra. In mid-February, I had an email from Rick Cook, head of the Southern New Hampshire University Music Dept., asking if I would be available to participate in this project which he is putting together. WOULD I!?!?! It is rare that a gig like this lands in one’s lap without having to audition or network. Rick had heard about me from SNHU’s voice instructor, Lindsey Rinaldi. I have never met Lindsey, but when I do I will certainly shake her hand and thank her for sending Rick my way. Rick also heard me sing “Urlicht” on my website, in a performance from 2004 with the NH Symphony, Kenneth Kiesler conducting. A couple of weeks later, Rick and I met over lunch to discuss the details. Rick is a personable and enthusiastic young man who happens to be a Mahler nut. 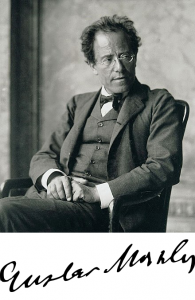 Now, Mahler can be considered by some to be an “acquired taste” because his music is dense, complicated, and thrilling. In fact, the composer’s music was somewhat obscure, at least in the U.S., until Leonard Bernstein “resurrected” his music, especially the symphonies, in the 1970s and 1980s when he was conductor of the New York Philharmonic. I found this clip of Bernstein’s “Young People’s Concerts” on YouTube. This series was quite popular in the 1960s – I fondly remember watching it every week when I was a youngster and already studying piano, soaking up everything available about classical music. Here is a link from 1960 to “Who is Gustav Mahler? Leonard Bernstein and the NY Philharmonic”: I hope you have time to view it. 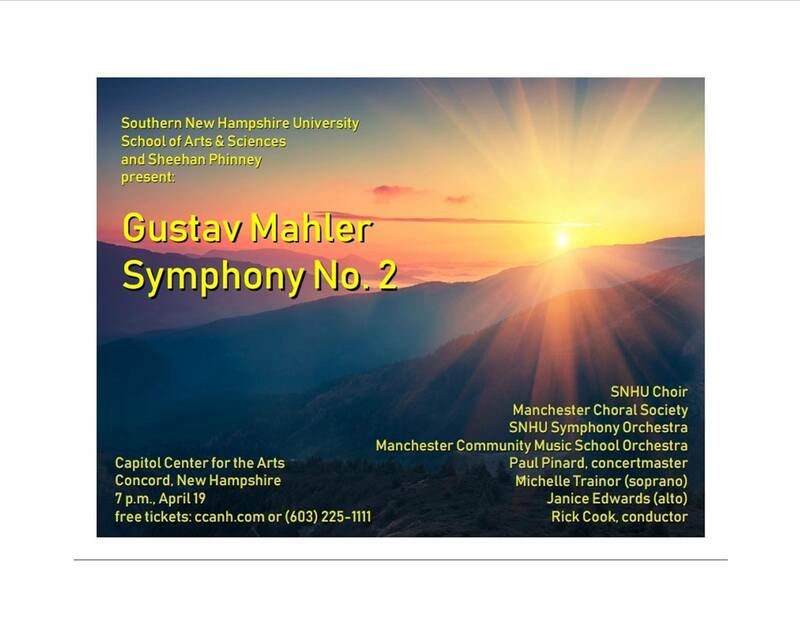 The “Mahler Second” is sponsored by the SNHU School of Arts & Sciences and Sheehan Phinney Law Firm. The participants are the SNHU Choir, Manchester Choral Society, the SNHU Symphony Orchestra, Manchester Community Music School Orchestra, and players from community orchestras all over the state. There is also a soprano solo in the last movement, and I suggested my colleague Michelle Trainor whom Rick engaged for this vital other vocal soloist. Coda: Leading the charge for this entire project – conducting and organizing – is Rick Cook. This piece is challenging for the most professional and experienced orchestra, much less a group of community musicians. I am more impressed than I can say that more or less non-professional but dedicated forces are undertaking this project. I can just imagine a serious community orchestra musician being both thrilled and terrified at the prospect of learning and performing this symphony, because it requires virtuoso level playing. My hat’s off to Rick and all of the forces who are making this come together. For free tickets, please visit ccanh.com to reserve your seat, and print at home (just like a boarding pass! ), or call 603.225.1111. I hope you can attend!